Vinyl flooring can resemble wood, ceramic tile, and stone—or simply consist of attractive graphic designs. It's easy to understand why vinyl flooring is a popular home flooring material: it's inexpensive, water- and stain-resistant, and super easy to clean. This makes it perfect for kitchens, bathrooms, laundry rooms, entryways—any areas with lots of traffic and moisture, including those below ground level. It's easy to install, and comes in thousands of designs. Vinyl is categorized as a resilient flooring material—a category that also includes similar floorings, such as rubber flooring, EVA foam tile, PVC plastic tile, and linoleum. Many of these floorings have similar attibutes—and similar installation methods—as true vinyl flooring. All of these resilient floorings compress and spring back so your steps have some bounce; this quality also makes them more comfortable to stand on than harder floors. Resilient floors feel warm against bare feet, too. Vinyl flooring is made of colored chips of polyvinyl chloride (PVC) formed into solid sheets by heat and pressure. 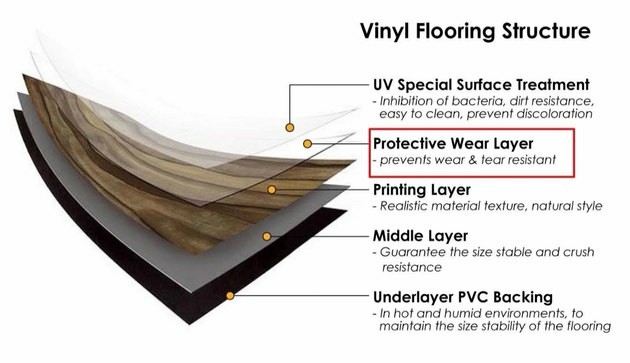 Different types of vinyl flooring vary in manufacturing process, PVC content, and thickness, but they're all petrochemical products, and they emit volatile organic compounds (VOCs) such as phenol. They will melt if you drop something hot like a lit match on them. credit: Top-Joy International Trading (Shanghai) Co., Ltd.
Vinyl flooring is composed of four or five layers, and sometimes more. The thickness of the wear layer determines the durability of the flooring; generally, the thicker the vinyl flooring, the stronger and more durable it is. When the surface print layer is damaged—besides tearing, this wear layer can also fade in sunlight—there's nothing to be done but replace the flooring. The fiberglass or felt backing layer gives the flooring additional moisture and mildew resistance, and the material used in this backing layer determines the type of adhesive required for installation. Vinyl-no-wax, the least expensive kind of vinyl flooring, is only somewhat resistant to black heel marks and stains. Urethane is a mid-grade vinyl that's more durable and low maintenance than vinyl-no-wax and more resistant to household chemicals and scuffs. Enhanced urethane is the most durable of the three. It withstands the heaviest traffic, has the greatest degree of stain- and scratch-resistance, and maintains its original luster longer than the other two finishes. A flexible material, sheet vinyl is generally sold on rolls 12 feet wide—you choose the length—and starts at less than a dollar per square foot. It's ideal for floors that see a lot of moisture because it's seamless and therefore impermeable. Installation: You can install sheet vinyl over most existing surfaces, including concrete, linoleum, ceramic tile, and vinyl, but a plywood layer feels best underfoot. Sheet vinyl will need to acclimate to your home for 48 hours prior to installation. Use the type of adhesive recommended by the manufacturer. Many manufacturers offer convenient installation kits to make sheet vinyl easy for DIYers to install. It requires patience and moderate skills but can be installed by most homeowners. One of the benefits of individual tiles is that you can replace a damaged one easily. You can also arrange different colored tiles in a pattern, and the smaller size makes it easier to manage for novice DIYers. The drawback is that spilled water passes right between the seams of vinyl tile—it may not be the best choice for kitchens and bathrooms. Luxury vinyl tile and luxury vinyl planks can be manufactured to mimic stone, ceramic tile, and wood, with a variety of natural colors and surface textures to heighten the realism. Some are even designed to be grouted. You'll find a number of tile styles, some stiff, others flexible. Square and rectangular tiles: Install them permanently with adhesive. Peel-and-stick tiles: Simply pull off the backing to expose the adhesive that was placed on the back of the tile during manufacture, put the tile in place, and press it firmly to adhere it to the floor. Not for high traffic areas. Planks and tiles with gripping strips: The gripping strips hold the pieces together for an easily installed floating floor. Interlocking rectangular planks: Designed to give floors the appearance of hardwood at a fraction of the cost. Loose-lay vinyl planks: These have a backing with a high friction coefficient that grips the subfloor, so you need no adhesive. They're removable and reusable. Installation: You can install most tiles over any existing surfaces, including concrete, wood, linoleum, ceramic tile, and vinyl. The underlying surface needs to be perfectly flat and well adhered. Installation of square tiles should start from the center of the room, working outward from layout grid lines. Plank-style products are best installed beginning from one side of the room and moving across to the other side. Rubber flooring is typically made from recycled material, so it's eco-friendly. Because rubber is an elastic material, a floor made of it feels especially cushioned. This quality, combined with the fact that rubber absorbs sound and is bacteria-resistant, makes it popular for playrooms and rec rooms. In workout rooms, rubber flooring protects the floor from heavy equipment and dropped weights. Rubber is water-resistant and can be laid directly on concrete slabs, so it's a good choice for basements. 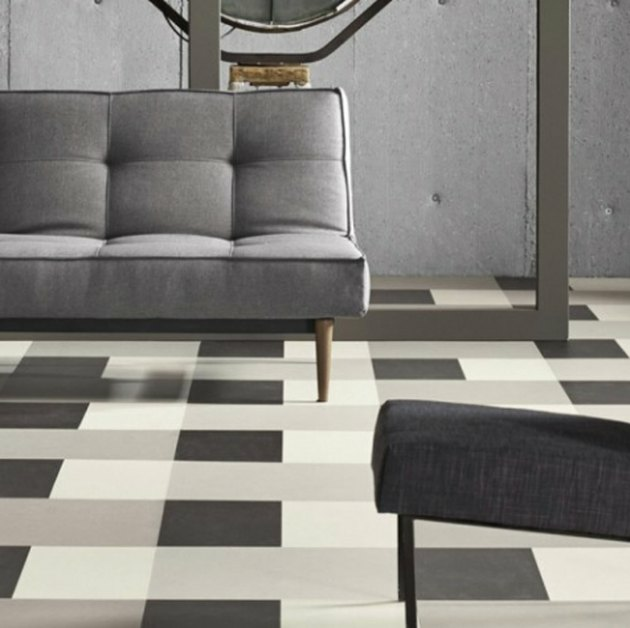 Aesthetically speaking, however, it might not be the right flooring material for other areas of your home. Since rubber flooring is not in wide demand, there are markedly fewer choices of color and texture. If you're considering it for your kitchen, keep in mind that grease and fat can stain rubber flooring; wipe up oily spills immediately, then clean them with warm water and a mild detergent. Home improvement stores sell interlocking rubber tiles in 12- or 24-inch squares that allow for quick installation and easy removal on existing floors, and they're just about indestructible. Go to specialty flooring retailers for precut rolls of rubber flooring measuring 4 x 25 feet, with varying thicknesses. The quality of rubber flooring is partially determined by its thickness and density—1/4 inch thick is good enough for home gyms, but 3/8 inch will give the best shock absorbency. Other factors to keep in mind are the quality of the rubber and binders used to make it, and odor-mitigating agents. Sniff the rubber you're considering buying; if it smells really strong, go with a different product. Installation: In homes, rolls of rubber flooring can be installed on pH-neutral concrete, approved Portland-based patching and leveling materials, and on wood subfloors using double-faced carpet tape at least 2 inches wide. For basements, put down a vapor barrier first to prevent moisture from seeping up through the slab. Tiles typically should not be adhered to the floor. When shopping for rubber tile, you'll probably come across interlocking EVA foam tiles, made an ethylene and vinyl acetate polymer. This nontoxic, BPA-free product sometimes comes with each side a different color, so you can set up checkerboard or other patterns. At roughly $3 per square foot, it's only slightly more expensive than rubber tiles. Like rubber tiles, it can be a good choice for exercise rooms, play areas, or utility spaces. 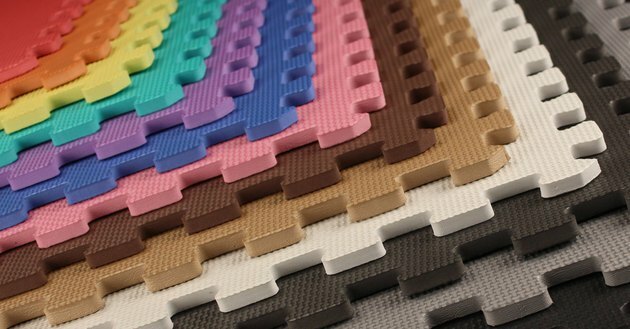 EVA foam tiles come in a rainbow of colors. 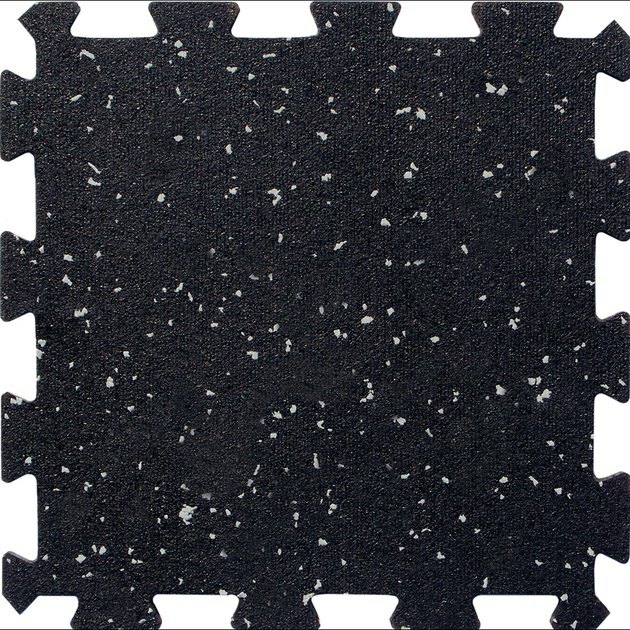 This interlocking rubber look-alike resists oil, grease, and many household chemicals, and comes in nonslip textures like diamond plate and coin, so it's good for garages and workshop areas. Linoleum reigned supreme as the inexpensive, go-to flooring for home kitchens and hallways from the 1870s to the 1950s, when vinyl replaced it in popularity. It has made a comeback because it's viewed as an environmentally friendly product, so it's now available in many more colors. 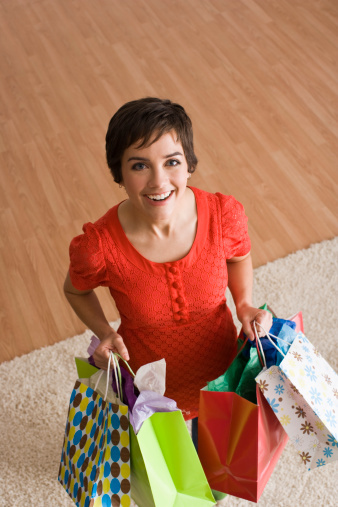 If your local big-box store doesn't stock linoleum, purchase it from a flooring retailer or green-building supplier. While it's often mistaken for or compared to vinyl flooring, linoleum is made not from petrochemicals, but from natural ingredients—linseed oil, wood flour (something like sawdust), pine resin, cork dust, ground limestone, and pigments. Linoleum, therefore, doesn't off-gas VOCs, and it's recyclable. Linoleum also doesn't set off allergies, and it's naturally resistant to bacteria. The pigment goes all the way through, so scratches and damage don't show and it's easy to repair them. Sheets 6 1/2 feet wide: The ingredients are mixed together, then pressed through a rolling mill onto jute backing, a material similar to burlap. Sheet installation is best left to the professionals, because linoleum is much stiffer than vinyl, and installing sheets requires understanding how the material will react to adhesive—it shrinks in length and expands in width, for example. Glue-down tiles: Linoleum is available in 13- or 20-inch squares, backed with polyester instead of jute, which keeps the material stable. This form is more accepting of DIY installation. Snap-together tiles: Designed for floating floors. The linoleum is mounted onto high-density fiberboard with a cork backing. Linoleum tile is considerably more expensive than vinyl. However, it wears much better and is incredibly durable—properly installed and maintained linoleum floors in commercial settings have lasted 40 years. Look for linoleum products that have a factory coating to give the surface enhanced protection against dirt and scuff marks. Not all linoleum floorings have it. Installation: Install glue-on tiles with vinyl flooring adhesive, using a 1/16-inch square notch trowel to apply it in sections so that the adhesive doesn't dry before you have time to apply the tile. Immediately go over the entire surface with a 100-pound roller. For snap-together tiles, put down a moisture-insulating underlayment first, then install the tiles using the same techniques as for a floating floor. 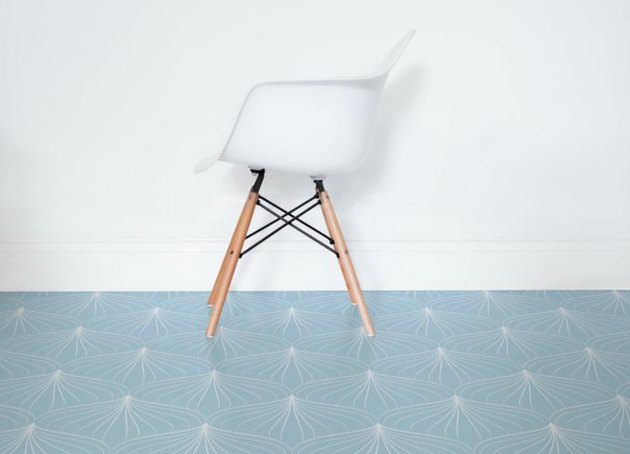 Create patterns on the floor using colored linoleum tiles.